Brandt, Henninger successfully defend school district in High-Profile Title IX Lawsuit - Fanning Harper Martinson Brandt & Kutchin, P.C. - Fanning Harper Martinson Brandt & Kutchin, P.C. Dallas (March 31, 2017) – With Dallas-based Fanning Harper Martinson Brandt & Kutchin, P.C. 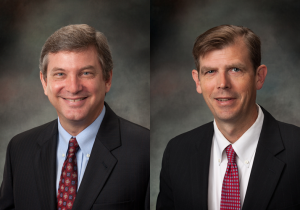 lawyers Thomas Brandt and Stephen Henninger providing sound legal counsel, the Lewisville Independent School District (LISD) prevailed in a lawsuit brought under Title IX of the Education Amendment Act of 1972. The lawsuit against LISD arose from allegations that the plaintiff, a former LISD student, was sexually assaulted in 2012 at a weekend party at a private residence where no adults were present. The plaintiff alleged that, after the assault, the student was harassed and bullied by other students. Plaintiff’s lawyers argued that the school district retaliated against the 14-year-old girl after her parents made a report of sexual assault, harassment, and bullying. A jury of seven women and two men listened to the case in the U.S. District Court for the Eastern District of Texas in Sherman, Texas, where U.S. District Judge Ron Clark presided. Charla Aldous, a Dallas attorney whose firm frequently takes on high-profile plaintiff’s cases, represented the plaintiff. In the suit, the plaintiff’s attorneys claimed that LISD administrators failed to follow the requirements of Title IX, failed to properly investigate the girl’s allegations of sexual assault and bullying, and failed to protect the girl. Plaintiff’s attorney argued that the school district retaliated against the girl by, among other things, delaying the start of the school’s investigation into the alleged assault, bullying, and harassment. Brandt and Henninger argued that the school district delayed its investigation because the police asked them to so. “There was no intent to retaliate,” said Brandt. The jury agreed with the school district in finding no retaliatory intent on the part of its administrators. Brandt’s longstanding familiarity with Title IX was key to successfully defending the school district. His practice at FHMBK includes representation of cities, counties, school districts, public officials and private sector clients in the areas of civil rights and employment law. His experience encompasses significant cases at every level of the state and federal courts, including numerous cases before the appellate courts, the Texas Supreme Court, the United States Court of Appeals for the Fifth Circuit, and the United States Supreme Court.